Do I have to have an ffl to ship a gun? Gunbroker.com also carries a list of cooperating FFLs, both in your zip code and the destination. Ringtail or Coatimundi or Racoon? I got this on my backyard cam in N Phoenix coming to water. I don't think domestic cat, what do you guys think? Any of those three would be unusual around the neighboorhood. Pay the trespass fees on Perkins and/or Larson Ranch. You’ll be one of few with scores of bucks to close in on. Sig makes a range of replacement factory front sight sizes/heights. Order direct from their website. 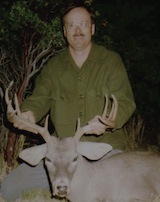 CatfishKev - took that Coues in 1991 on Fort Huachuca, Area R, east of the rodeo grounds. azruger - FYI, took that one with a Ruger No 1 300 H&H. Nice typical 4x4, not a Kaibab monster, but he's mine. Opening day, 70deg and sunshine but the rut is full on, and that was this guy's downfall - not paying attention to anything but his does. SCI 156 7/8. Many thanks to my outfitter, Big Chino & Sons out of Prescott, for the help and assistance. Everyone in the Big Chino family - guides, helpers, the camp cook - is either a firefighter, EMT, or paramedic. Veteran friendly. Just did it yesterday. Logged into the portal, selected "you have applications"
Do it. It doesn't get better on its own. The PT afterwards was the most painful I've ever had (and I've had three spinal fusions) but, 6-8 months later you are healed. Rotator Cuff recovery is a long haul. My surgeon was Dr. Michael Brennan in Phoenix. His office does the ortho for the Diamondbacks. I figured he's seen a lot of shoulders and elbows. Also R, M. They will cross the Canelo Rd into the flats just at the turn of dusk and down. Jim, when you say treat for bugs, what's the process/chemical? Subscribe to the FMWR Sportsman's Center Facebook page. They post open/closed range areas each week. Also be aware that some traditional good areas (T1, T2, T3) are now permanently closed due to unexploded ordnance. Also, Post access control points (the Gates) have changed this year. Think about Areas S, R, N.
Be crazy not to get the Big Bo pass. Elk palmation racks, lets see them!